Dimpus Burger Clerk: (Into mic) Double bacon cheeseburger. It's for a cop. Clerk: No, I just told him that so he makes it good. (Into mic) Don't spit in that cop's burger. Farva: Whatever. Give me a pie�apple. Clerk: Want me to hold the spit in that one? Just kidding Officer Farva. Would you like to Dimpusize your meal for 25 cents? Farva: Want me to punch-isize your face...for free? Too often comedies wear out with repetition—the same beats, the same situations ad naseum. So imagine the sheer glee when, on the fifteenth viewing, I still find myself in love with the jokes, situations and sight gags found in the hilariously funny Super Troopers. Here is a film that is in love with the idea of humor for laughs and not for the sole purpose of being more shocking and offensive than the year's other releases. In the lovely, but boring, state of Vermont, a group of five highway patrol officers spend their time doing what every honest cop should. They chug syrup for competition, harass speeders with often demeaning games, and plays tricks on each other as well as the embittered local police force. But life for Thorny (Chandrasekhar), Rabbit (Stolhanski), Mac (Lemme), Farva (Heffernan), and Foster (Soter) is about to change as their station seems to be the next causality in a long line of state budget cuts. With their backs against the wall, as well as a murder and large drug bust in the span of 48 hours, the troopers will have to cut their games short and do some real police work�well, sort of. Playing like a delightful cross between Cops and The Kids in the Hall, Super Troopers has the sort of undeniable charisma in its cast and writing that is immediately likeable. While some critics found this to be a detriment to the film, I would like to think it adds to the overall enjoyment of the picture. The five don't necessarily walk and talk like normal cops; instead, the characters seem like five friends enjoying the lifestyle of holding a badge and the authority that comes with the job. Starring the members of the comedy troupe Broken Lizard, Super Troopers works to best advantage because of the closeness and chemistry of these performers. The film may not be about anything in particular, but with the abundant energy that radiates from the central characters, this can only be a minor complaint. If the film has a fault, it is that the script feels pieced together by skits rather than a central, flowing storyline. Several of the scenes feature jokes or sequences that have no real bearing on the story and exist only to throw one more joke at the viewer in the hopes of gaining another laugh. Normally, this would be the kiss of death for a film comedy, but here the jokes and skits are done with such creativity and humor that the transition from one "skit" to another is never a problem. From games played with speeding motorists (including one in which the central goal is to say "meow" ten times) to the creation of a new animation subculture (Afghanistanimation), the script keeps the jokes coming at what seems to be a record rate. The supporting cast is comprised of familiar faces, including Brian Cox as O'Hagen, the captain of the highway patrol station that the boys call home, as well as the beautiful Marisa Coughlan as a possible love interest for Foster. Each does a fine job with their performance, though at times they seem overshadowed by the five central characters. Look for Linda Carter in a cameo appearance towards the end of the film. Though sophomoric in its humor, Super Troopers offers more laughs in it first fifteen minutes than I found in the entire length of the latest Austin Powers installment. Perhaps it is a welcome sign when a film that made less in its entire run than a blockbuster often does in a single day is able to run laps around its competition in terms of quality. 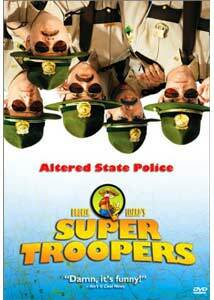 Try Super Troopers, you won't be sorry. Image Transfer Review: Presented in a 1.85:1 anamorphic widescreen transfer, Super Troopers looks nice considering its low budget beginnings, though the effort presented here is not on par with other offering from Fox as of late. The transfer offers fine sharpness and detail portion but often the image suffers from a sort of haze cast across the screen. Edge enhancement is noticeable from time to time though it never becomes too distracting it is certainly there. Colors are done nicely with the vibrant greens and blues in the exterior shots coming off particularly well. The transfer is nicely done, though a few small problems keep it from obtaining a higher grade. Audio Transfer Review: There is little excitement to be found in the Dolby Digital 5.1 sound mix. Dialogue sounds fine out of the center channel, as it is crisp and clear throughout. The music used in the score sounds clear as it travels from the front to rear speakers throughout the film. There is no real sound to be heard from the .1 LFE channel. Overall the track is typical for a comedy film with a low budget. Extras Review: Fox has blessed Super Troopers with a nice selection of bonus material on this new DVD, including a pair of commentary tracks that feature the members of Broken Lizard. The largest problem with the tracks is that while funny, they often share the same stories and material. The first track by director Jay Chandrasekhar and actor Erik Stolhanske (Thorny and Rabbit) focuses more on filmmaking and the numerous changes that were made from finished script to finished film. Chandrasekhar does deserve credit for admitting what he wishes he could change or what sequences he could cut from the film; I admire filmmakers who are open about their mistakes in their commentary tracks. The second track is more humorous, and allows the other members of Broken Lizard (Heffenan, Soter, and Lemme) the chance to discuss their thoughts on the film. The track is never technical (though Heffernan did serve as an editor and on one occasion he discusses this) and instead serves as a way for the three to brag about their acting, point out friends, and discuss the big name stars and how they came to be in the film. The most impressive anecdote to come from this track is that ESPN�s Dan Patrick was originally wanted for the role of the mayor in the film. Now that would have been amazing. Next is a collection of outtakes as well as fourteen alternate scenes with optional commentary by Broken Lizard. Each scene is really nothing more than an existing sequence with a bit of new dialogue included. There are no real deleted scenes, but some do benefit from the additional lines. The outtakes are worth a look for the simple fact that it shows the cast members actually chugging syrup at length and shows that a total of four bottles—each—were used. Yikes. Rounding out the extra features is a short making-of featurette, "Road trip news wrap" that chronicles the troupe's trek across America to promote their film at colleges and trailers for both Super Troopers and the inanely moronic Kung Pow: Enter The Fist. In the end there is little about Super Troopers that signals the second coming of any great artists, but there is something about the film that offers the sort of laughs that are so sorely missing from a lot of today's comedies. There are moments where the script fails to offer a chuckle, but the sheer amount of hilarity found overall, there is little to deny that Super Troopers is a hidden gem in the comedic genre. Highly recommended.